Surely you all noticed last week that so called anchored putting stroke will be banned as the result of a purposed rules change by the USGA and R&A. According to rule 14-1b: “In a making stroke, the player must not anchor the club, either ‘directly’ or by use of an anchor point.” And then there are two additional notes. Note 1: The club is anchored ‘directly’ when the player intentionally holds the club or gripping hand in contact with any part of his body, except that the player may hold the club or gripping hand against hand or forehand. Note 2: An ‘anchor point’ exist when the player intentionally holds a forearm in contact with any part of his body to establish a gripping hand as a stable point around which the other hand may swing the club. Back to the topic. This new rule applies of course to belly putters, in which the top of the grip is anchored in the stomach, and long putters that are anchored to the chest with the top gripping hand. 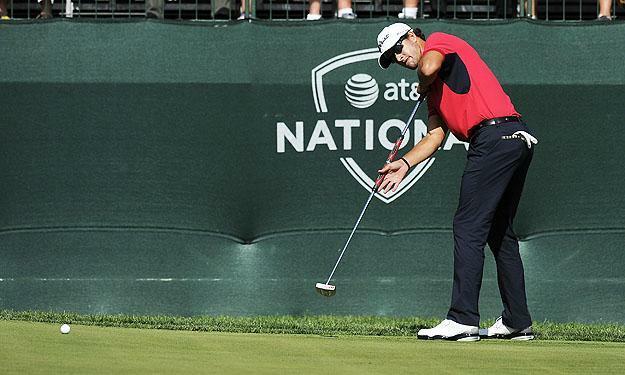 Allowing the putter grip to rest against the forearm of clamping the putter grip to the forearm would still be allowed, and actually Odyssey just published their 1st anchor alternative putter model – The Arm Lock Putter – only two days after golf’s ruling bodies proposed a ban. Fast act! Not an equipment rule. Conforming equipment, inc. belly-leght and long putters, would remain permissible provided they are not anchored. USGA’s executive director Mike Davis said that the rule change was meant to clarify and define the nature of what stroke should be under the Rules of Golf. Player should hold the club away from his body and swing it freely. Both ruling bodies also made clear that the new proposed rule is not an equipment ban, such as for example was a driver rule in 2006 when they defined the maximum MOI-ratings (alias trampoline effect). Golf balls will be next…? Currently, there is a comment period going on. Ruling bodies like to hear players and equipment manufactures comments before the rule assumes its final form. When the decision is final, the new rule would take effect on Jan 1, 2016 in accordance with regular four-year cycle for changes to the Rules of Golf. Personally I’ve never had anything against the long putters and achoring. I’ve tried it couple of times too on the putting green only to realized that technology is way too hard for me. I am putting much better with a traditional short putter. Actually I’ve never even understood how someone can putt with the long ones. If you haven’t tried it, take a shot. It’s hard! LPGA-player Sandra Gal has felt the same way: to be honest with you I find it harder than my short putter and I don’t an advantage there, she said. Paul Azinger, former Ryder Cup captain who launched the belly putter into prominence with a seven shot victory at the 2000 Sony Open, said that the belly putter doesn’t guarantee you’ll putt better. But today’s drivers will guarantee you’ll hit the ball farther. Good point from Azinger. And if you compare the averages from PGA Tour’s stats center, you’ll see that he’s right. Driving distances have increased significantly in last 20 years but putting averages have remained the same. First was rule for driver’s MOI-ratings. 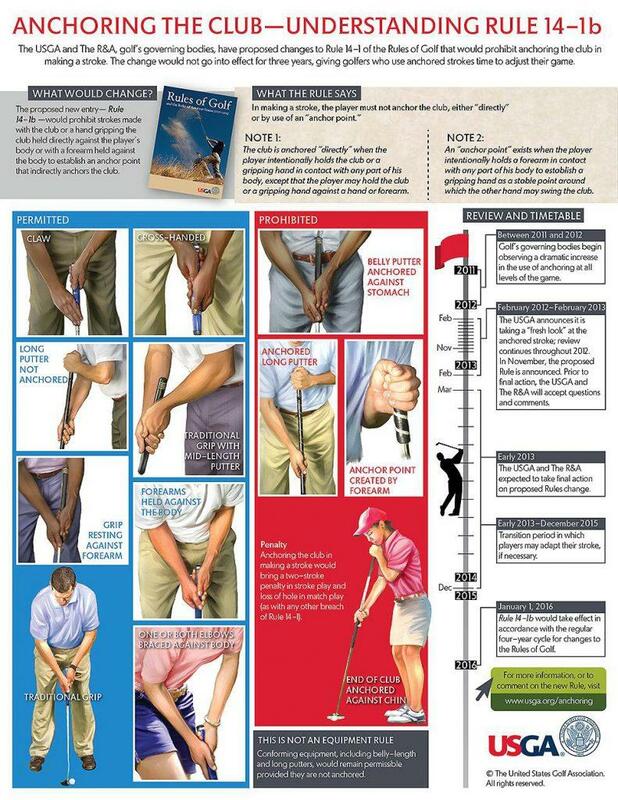 Then groove rule for irons. Now putters. You don’t have to be a good prophet to foretell that golf balls will be the next equipment under the radar. Let’s see how the discussion will progress. In any case the equipment industry will, once again, prevail at the end. … and last but not least: Remember friends to enter our Xmas competition on our Facebook site. Show us how creative poet you are! Grand Prize is a Samsung Galaxy Note II phone, so take a part now and be creative! See ya on Facebook! Are You a Birdie Commander?